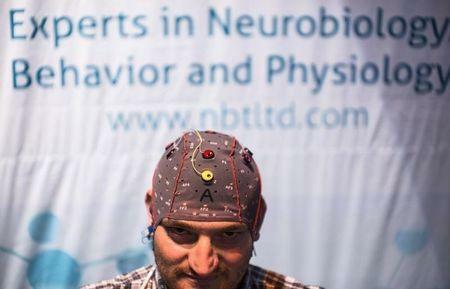 NEW YORK (Reuters) - From ways to eavesdrop on brains and learn what advertisements excite consumers, to devices that alleviate depression, the number of U.S. patents awarded for "neurotechnology" has soared since 2010, according to an analysis released on Wednesday. Most surprising, concluded market-research firm SharpBrains, is that patents have been awarded to inventors well beyond those at medical companies. The leader in neurotechnology patents, according to the report, is consumer-research behemoth Nielsen. That expansion into non-medical uses, said SharpBrains Chief Executive Alvaro Fernandez, who presented the results at the NeuroGaming conference in San Francisco, shows we are at the dawn of "the pervasive neurotechnology age," in which everyday technologies will be connected to brains. "Neurotech has gone well beyond medicine, with non-medical corporations, often under the radar, developing neurotechnologies to enhance work and life," he said. Patents for neurotechnology bumped along at 300 to 400 a year in the 2000s, then soared to 800 in 2010 and 1,600 last year, SharpBrains reported. Those awarded to medical device company Medtronic PLC, for instance, include ways to use electroencephalography (EEG) to measure the severity of a brain lesion. Several held by medical technology company St. Jude Medical Inc. describe ways to change brain activity to, say, improve vision. But it is the explosion in non-medical uses, such as controlling video games with brain waves, that is driving neurotechnology. SharpBrains measured "intellectual property (IP) strength" by number of neurotechnology patents as well as patent quality, reflected in how many other patents reference them, for instance. By that measure, Nielsen leads the pack, with patents describing ways to detect brain activity with EEG and translate it into what someone truly thinks about, say, a new product, advertising, or packaging. Microsoft Corp. holds patents that assess mental states, with the goal of determining the most effective way to present information. If software knows a user's attention is wandering, it could hold back complicated material. Another Microsoft patent describes a neuro-system that claims to discern whether a computer user is amenable to receiving advertisements. Such patents reflect the enthusiasm for neuro-monitoring, something many scientists say has not been shown to be more effective than, say, asking people what they think about a product. On a lighter note, an EEG patent awarded to San Jose-based biosensors company NeuroSky describes a design for a headset that could deliver music based on a user's brainwaves, perhaps a ballad when the listener is feeling contemplative.